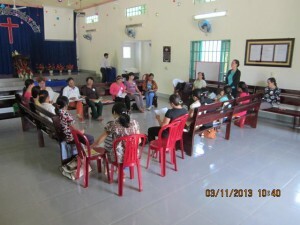 The first of 12 women’s conferences (one a quarter for three years) was held on March 11-13th at the Binh Chau Church. We praise God that 17 ladies (picture above) from the Binh Chau Church attended the three day conference. The two teachers from Saigon were well prepared and very enthusiastic in their teaching. In this first session, the women were given an overview of the three year program and much time was spent getting to know one another better. The ladies from the Binh Chau Church so enjoyed this time together and stated they can’t wait for the next conference this summer. Please pray that God will use these conferences to help these ladies grow in their personal relationship with the Lord, develop deeper family relationships, build a stronger bond with each other, learn how to encourage each other, and develop a desire to serve in the church. 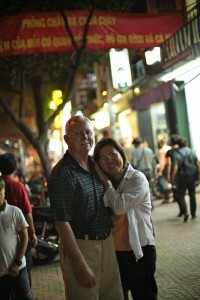 Each lady was asked to save 50,000 VN ($2.50 US) each time they met. This money would then be used for them to attend a Women’s Retreat, with ladies from other churches going through the same program, at the end of the three years to celebrate. 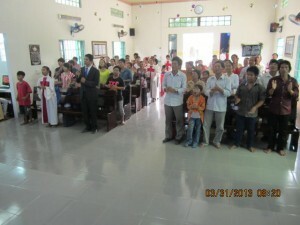 As like here in theUSA, the Binh Chau church was packed (picture above) for the Easter Sunday Worship Service. Elder Nhan gave the message of the Resurrection. Later that afternoon many members of the congregation went down to the ocean together to have a sweet time of fellowship. They played games, sang songs, and of course, enjoyed sharing a meal together (picture above) provided by some of the ladies in the Binh Chau church. God continues to work through the Suoi Bang church plant to expand His kingdom as three more people accepted Jesus as their Lord and Savior this last month (one from Suoi Bang and two relatives of Mr. and Mrs. Ba Quang visiting from Saigon). CAM ON CHUA! Mr. and Mrs. Ba Quang are such faithful and humble servants. They spend a lot of time visiting people around town (on their very old motorcycle) sharing the Gospel and inviting them to their house. They have no refrigerator so Mrs. Ba Quang went out and bought a small one on credit. She didn’t ask the church to help, but said she still works cutting banana leaves and can use that money to make the payments. They are so grateful for what God has done for them and their marriage that they are excited to witness to anyone about His love and mercy for them, all for God’s glory. Preparations for the 2013 VacationBibleSchoolat the Binh Chau church are under way. This year’s VBS will be our 6th one and will be held on June 25-27. Last year we had 133 kids who attended and 33 accepted Jesus as their personal Lord and Savior. We were able to reward 29 of them with new bikes. Please join us in praying for a similar turn out this year. 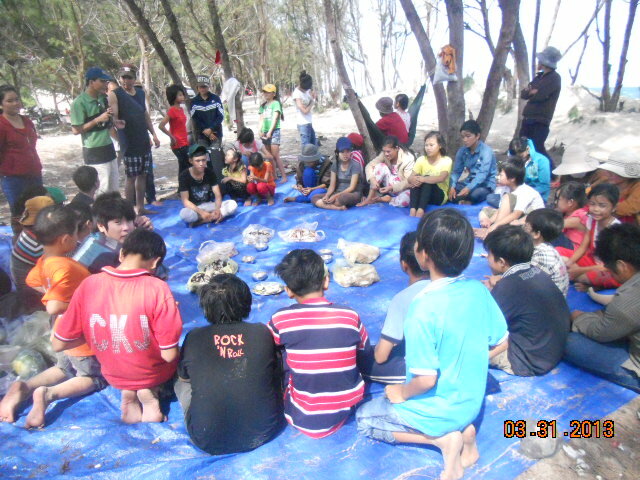 All the kids will be spending all 3 days at the church (day and night). Even though the kids love the trip, we will not be taking them to the amusement park in Saigon on the 3rd day due to the cost of this trip has increased substantially. Please look for our table at CFC on Sunday, April 28th, Sunday May 5th, and Sunday, May 12th if God leads you to sponsor one or more of these precious children for VBS ($45 per child). We are also in need of donations for bicycles ($50 each). We thank God for all of you who have sponsored and/or donated for the VBS over the last 5 years. Your generous gifts continue to allow us to share Jesus with God’s precious children in Binh Chau in the hope He will raise up a new generation that will love Him with all their heart, soul, and mind. We are witnesses to the impact that you are having on the lives of these dear children and their families all for the glory of God. We thank you. We love you. We pray God will bless you abundantly for all you do to further His kingdom. Please pray that God will open the door and provide the funds for another building to be built on the church property to meet the physical and spiritual needs of so many hurting children. 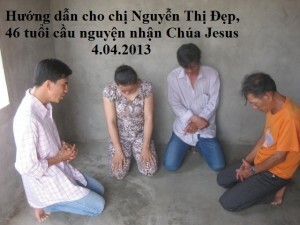 Please pray that God’s protection will be on Mr. and Mrs. Ba Quang as they open their home to Sunday Worship services. Please pray that God will raise up more laymen to serve in the Binh Chau church. Please pray that God’s protection would be on all the children (and adults) as they are transported to and from the church by motorcycles. Please pray that God’s protection will be on the Tan Thang children as they continue to be left alone while their parents are away working in another town. God’s Word continues to go forth and not return void as a total of six people have accepted Jesus this past month; the 3 in Suoi Bang, 2 in Binh Chau, and 1 from Tan Thang.